Global Water Resources is a small Phoenix-based water and wastewater provider. The company is positioned for massive growth in and around the Phoenix metro area in the coming decades. Arizona is a uniquely good environment for this company's strategy to play out. GWRS stock has excellent demographics and regulatory environment favoring it. The company has excess capacity at present which will allow earnings to grow quickly in the coming years as new developments come online. GWRS stock yields 3%, the dividend is paid monthly, and it offers annual dividend hikes. The actual number is even lower, as some of those are either foreign, like SBS, or do not actually sell a large amount of water to customers at this time, such as CDZI and PCYO. As you can see, the field of investable candidates is pretty small, which makes it easy to do due diligence on the industry. As I often like to do, I took a look not just at the biggest companies (see my bearish take on American Water Works), but also the smallest ones. And in Global Water Resources (GWRS), we have an interesting little water utility indeed. The privatization of government in America is the most important thing that's happening, but we're not focused on it. We haven't thought of it as government yet..."
When and if these leaders are picked in a private election, the vote is rarely counted in the manner of Jeffersonian democracy, with each citizen having a voice. Instead, it is usually one dollar, one vote." Why does this matter to Global Water Resources? Because you have large quasi-corporations such as the Salt River Project that make big decisions about water and electricity usage and rights in the Phoenix area. That's instead of politicians having control over these functions. An entity like Salt River Project tends to not get much press and can enact its will with little pushback. It gets to issue tax-free bonds, has the privileges of a private company, and even acts as a federal agent in distributing water. And it is controlled by voting from landowners based on the amount of acreage controlled (not the number of people involved) meaning that decisions will be made by wealthy folks that control tons of land and usually want more growth. Salt River, and other such entities, control large budgets, have political action committees, hire numerous lobbyists, and so on to control politicians even further. You can argue about the ethics of this form of government, but say what you will, it is great for business. You won't see the likes of Amazon pulling out of a deal with Phoenix over insufficient support from the local community, as we saw with Queens, NY recently. Shadow governments "move into vacuums," one long-time observer says. "They get into one issue and they've got a professional here and a technician there. And then they'll give you an opinion on what you're ordering for lunch. And before you know it, they've named two of your children. They eat up power, like the science-fiction movies. They eat living things, derive power from what they've ingested, and develop an independent power base." As Global Water Resources is essentially a bet on unchecked sprawl in the greater Phoenix area, this is precisely what we want to see as shareholders. For more than 13 years, Mayor Price has been an entrepreneur and small business owner. He is a partner of the Sierra West Group, a financial advisory firm." This was all essentially nothing but sand 25 years ago and has sprawled out quickly in recent years. As you can see, Global Water Resources itself is located in the middle of a half-built residential community surrounding an artificial man-made lake/canal thing. The bull case on this stock almost writes itself - water usage is absolutely going to explode here if Phoenix keeps growing, and Global Water will make out like crazy. Does Global Water's plan make sense? I would argue that yes, it does. Arizona is currently the fourth-fastest growing state in the U.S. according to the Census Bureau. Its nearly 2% annual population growth rate is triple the national average. All the fastest growing states (Nevada, Idaho, Utah, Arizona) are in the Southwest and have large and/or rapidly growing Hispanic populations. This makes sense as these areas have minimal local government regulation, making development easy and cheap. They also have proximity to Mexico, along with a high number of jobs that are suitable for migrant and undocumented labor. Considering that Hispanic-Americans are set to overtake Caucasians as the largest single demographic in the U.S. sometime around 2050-2060, investing in the areas where these populations are settling makes a great deal of sense. Phoenix is already 41% Latino, and Tucson is close to 50%. This means that areas like Maricopa and Casa Grande, where Global Water operates, should have a large supply of incoming Latino-American residents who desire affordable housing and are also unlikely to be prone to environmentalist/NIMBY tendencies that could hold back growth in other regions of the country. Additionally, it's worth noting that the company controls rights for water development for other areas of currently uninhabited desert around the Phoenix area. One such area, near Buckeye, AZ, is the site of a proposed "smart city" that the people running Bill Gates' fortune are planning. The Gates organization plans to build a whole new city with 80,000 houses, nearly all of which would use Global Water Resources taps. This alone, if it came to fruition, would triple the size of Global Water's business as compared to today. However, that is years if not decades off. The above section highlights one of the clear risks to Global Water: not only are they reliant on one state (Arizona) or even one city (Phoenix) for their revenues, they get most of their business currently from one section of suburban sprawl well outside of Phoenix itself. So far this has been a brilliant bet, as Maricopa is exploding in population. Since 2004, Global Water has octupled its revenues and increased its service taps in use 8,000 that year to 40,000 in 2017. Most water utilities predominately "grow" only through acquisitions and rate hikes. Global Water is booming as each new housing development built in its service area adds a big new stream of revenue at little additional cost to the utility. Furthermore, it's possible that development patterns will change in the future. I'm far from convinced that millennials are "killing suburbs" as some have claimed. But it's possible. New technological innovations, such as self-driving cars, could radically change the layout of our cities and suburbs, making a bedroom community like Maricopa less (or more) appealing. 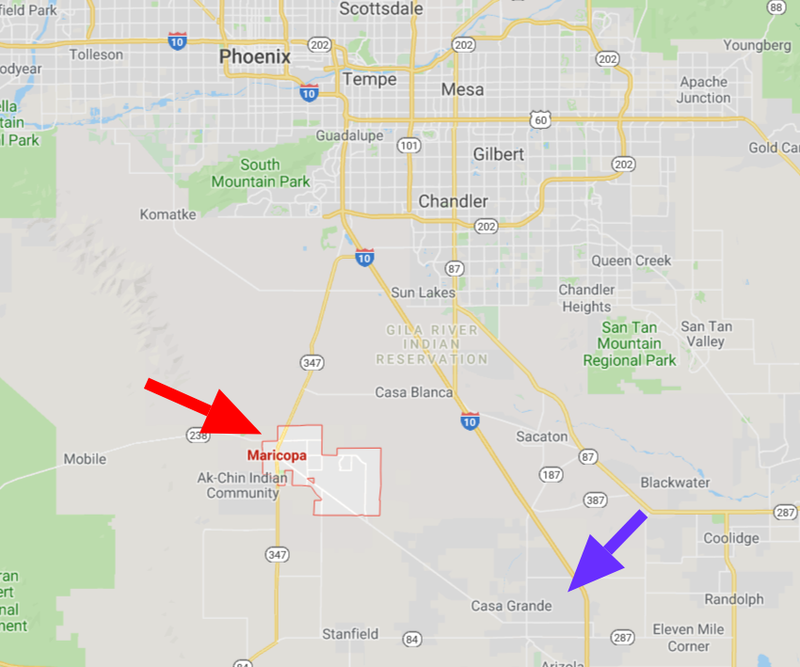 Also, a huge increase in the price of gas, should it happen for whatever reason, would make far-flung areas like Maricopa less attractive to prospective landowners. Make no mistake, when your revenues are coming predominantly from one city, you are taking more risk. That said, Global Water appears likely to keep consolidating other utilities around Arizona and the southwest going forward, so this risk should diminish to some extent over time. Switching gears, one risk you often seen tossed around for Global Water Resources is that Arizona is already a desert and that climate change is likely to intensify the lack of water resources in the state. That may be true. As the saying goes, climate science is above my pay grade, but should the theory be true and the models be predictive, then Arizona will likely experience an even more scarce supply of water going forward. There is no guaranteed source of water. Our ability to meet the existing and future water demands of our customers depends on an adequate supply of water. Regulatory restrictions on the use of groundwater and the development of groundwater wells, lack of available water rights, drought, overuse of local or regional sources of water, protection of threatened species or habitats, or other factors, including climate change, may limit the availability of ground or surface water. As stated above, our primary source of water is pumping of groundwater from aquifers within service areas. In the event that our wells cannot meet customer demand, we can purchase water from surrounding municipalities, agencies, and other utilities. However, the cost of purchasing water is typically more expensive than producing it. Furthermore, these alternative sources may not always have an adequate supply to sell to us. If we are unable to access adequate water supplies, we may be unable to satisfy all customer demand, which could result in rationing. Rationing may have an adverse effect on cash flow from operations." Furthermore, the company highlights the ongoing risk should drought conditions worsen. They state that in the past, other water systems within the Phoenix area have run out of water from aquifers, necessitating the use of more expensive trucked-in water. The company notes that it may have to build more infrastructure at a significant capital cost should water supplies dry up. In addition, customer usage tends to drop during droughts/rationing and may not increase back to previously normal levels once a drought ends as customers acclimate to using less. I note all this in the interest of full disclosure. However, I'm not especially worried about drought/climate change as a big impact on the thesis. Americans are wealthy enough - and Phoenix is a high income metro as it is - to pay up for access to water. I don't expect folks to skimp on water usage simply because the price goes up. I lived in intense drought conditions for years in Colorado, and there was only modest customer behavioral change even during periods of rationing and higher prices. Also, again, give the weak governmental structures in the Phoenix area, it is hard to see how opposition would come about to rate hikes from Global Water anyway. The metro area is controlled by developers, and developers can't build anything without new water taps for their latest homes and office buildings. Finally, Global Water is a true micro cap stock with a $200 million in market cap, only ~42,000 customer taps, limited trading liquidity on the NASDAQ and so on. Small businesses historically outperform large ones, but they also come with greater risks. It could be years, if not decades, before Global Water becomes a major mid or large-cap stock that can enter the S&P 500 and get more trading liquidity and analyst coverage. Global Water: What's It Worth? There are quite a few ways to think about valuation for a small company with a lot of growth upside as part of the valuation, such as Global Water. On a recurring earnings basis, the company is generating roughly 25 cents a year in EPS right now. That amounts to a P/E of around 36, which is obviously not cheap. Before accusing me of hypocrisy for saying American Water Works is too expensive at 31x earnings the other day, let's consider a few things. For one, Global Water's current in-place infrastructure can handle roughly double the amount of connections that it currently has now. That means that Global Water has another ten or twenty years of growth in Maricopa already set without major capital spending either to acquire new utilities or build new infrastructure. Given the rapid growth in Maricopa and surrounding areas, these new taps are coming into service at a healthy clip - the company is currently running a ~7% growth rate on both water and wastewater revenues. 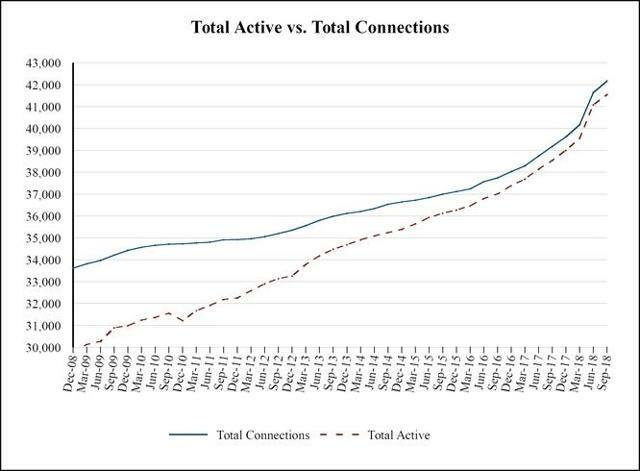 As you'd expect, this new revenue is high margin, as the infrastructure is already in place. We believe that our utilities and service areas are directly in the anticipated path of growth primarily in the metropolitan Phoenix area. 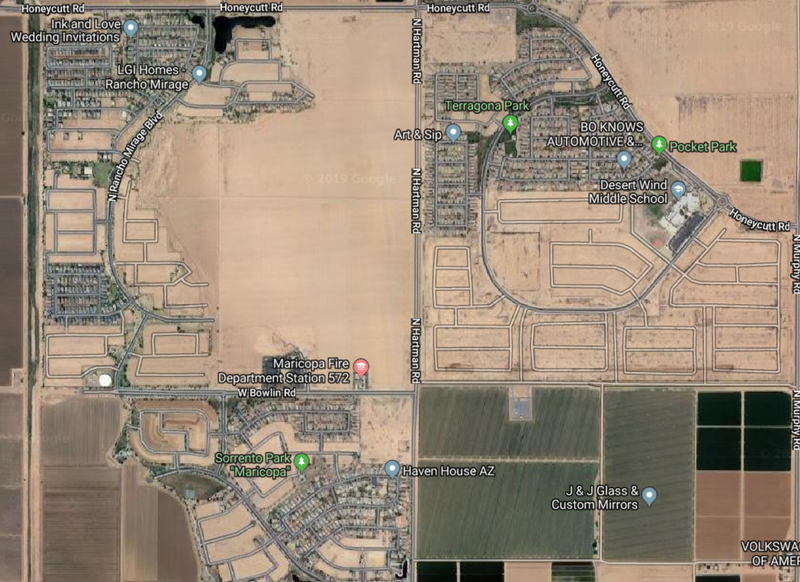 Market data indicates that our service areas currently incorporate a large portion of the final platted lots, partially finished lots, and finished lots in metropolitan Phoenix. Management believes that we are well-positioned to benefit from the near-term growth in metropolitan Phoenix due to the availability of lots and existing infrastructure in place within our services areas." 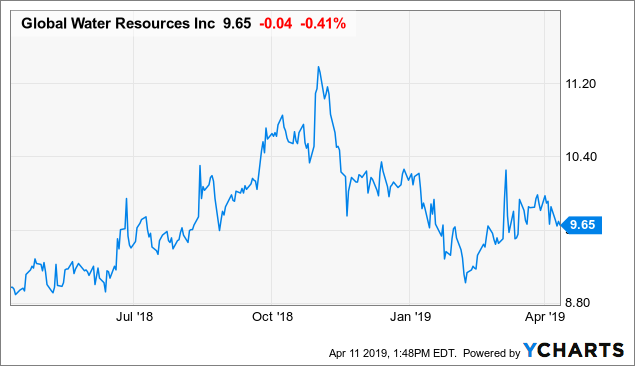 One thing to keep in mind is that the company issued a modest amount of stock (1.7 million shares, or roughly 8% dilution to outstanding) last summer at $9.25/share. At the time, GWRS stock continued trading higher, ultimately hitting $11. It has now fallen back to $9.65, allowing us to buy near the same point that institutions supported the company with a deal. For a growth company with a steadily uptrending stock price, you're generally getting a reasonable deal if you buy at/below the same price as a recent secondary offering. What did Global Water do with that money? 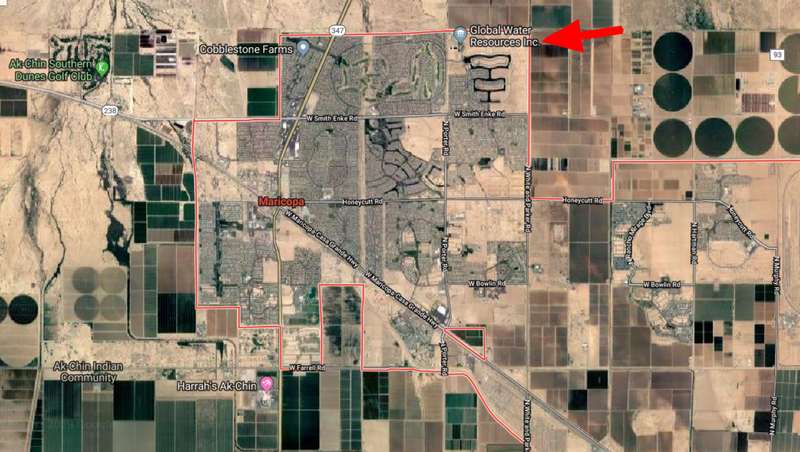 They spent a third of the issuance to buy Red Rock utilities, which currently serves one major subdivision on a highway exit about 30 miles northwest of Tucson. Why is this a good deal? They bought it from a real estate development company, which presumably built the subdivision and has no interest in maintaining a water utility in perpetuity now that most of its houses are sold. The company got 1,600 water hookups as a result of the deal plus 9 square miles of new coverage area for the tons of new homes and development that may follow this first subdivision. It's possible that the surrounding desert will never amount to anything, but as it is, the company only spent $6.1 million to get an already decent-sized business (added 4% to their total water tap count) and another huge land package somewhat near a major city. Recent changes in the regulatory environment in Arizona make it significantly more difficult for sub-scale water utilities to keep operating independently. This opens up the playing field for Global Water to accelerate the rate of bolt-on acquisitions, such as Red Rock, to its existing portfolio. In addition to the funding from the stock issuance at a decent price, I'd also note that the company refinanced its long-term debt and now has a very desirable position particularly if interest rates keep rising. Substantially all of the company's long-term debt is in two issuances. One is a 4.4% interest bond due in 2028 and the other is a 4.6% bond due in 2036. This pretty much eliminates interest rates as a short-term issue for the company, as its nearest debt doesn't mature for nine years. It's possible that GWRS stock will take a hit if rates rise, devaluing the dividend. That said, GWRS stock yields more than almost all the other water utilities, so it doesn't seem that investors are too perturbed by 2% yields out of the sector as it is. The stock looks expensive for what it is right now, though not egregiously so, in comparison with other water utilities. If growth dramatically slows or stops in the Phoenix area, this stock will underperform other water utilities. On the upside, however, if the area's sprawl continues, I see an easy path to earnings tripling over the next 10-15 years. Combine that with the company's 3% dividend, which is paid monthly and is hiked every year, and you have a fantastic growth and income stock. It's also worth noting that when you back out depreciation, the dividend is covered from earnings. The stock issuance was to acquire more assets such as Red Rock, not to fund the dividend. Also, since virtually all Global Water's service areas are new build suburbs, they don't have legacy pipes and thus don't have major maintenance/rebuilding costs (think Flint, MI) coming up any time soon. This is a major competitive edge versus legacy water utilities that do not show up in the P/E ratio or other easy comparison metrics. It's hard to put an exact price target on Global Water as so much depends on how many further acquisitions the company makes and how fast Phoenix and Tucson keep growing. The stock could also get hammered in a recession when building permits (temporarily) slow down for Phoenix again. That said, as a buy and hold for decades sort of stock, GWRS looks highly appealing here under $10 and the dividend is large enough to provide substantial support for the stock while paying us nicely for holding shares. This is an Ian's Insider Corner report published February 14th for our service's subscribers with GWRS trading at $9.20/share. If you enjoyed this, consider our service to enjoy timely access to similar initiation reports for all the new stocks that we buy. Membership also includes an active chat room, weekly updates, and my responses to your questions. Disclosure: I am/we are long GWRS. I wrote this article myself, and it expresses my own opinions. I am not receiving compensation for it (other than from Seeking Alpha). I have no business relationship with any company whose stock is mentioned in this article.